If you’ve ever… felt drained after listening to a chronic complainer, or heard that someone else took credit for your work, you know that it’s possible to steal more than material goods. Practicing ahimsa also invites us to abstain from other forms of violence that may be less obvious yet all too common in daily life, such as starting or listening to gossip, aggressive driving, … or being sarcastic at others’ expense. It can be hard to fit a mindfulness practice into an already-packed schedule. But even at the busiest times, we all have at least a minute to stretch, take a deep breath, calm down, and remember our priorities. 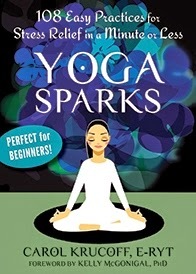 Trying just one or two "Yoga Sparks" every day can lead to significant benefits.